Recipes and formulas for “3 Day Detox” or “Instant Detox” are all too common on Pinterest and in health magazines. These fads usually encourage drinking some type of green smoothie, downing gallons of water and eating copious amounts of lettuce. Unfortunately, these instant detox schemes can actually harm the body and they overlook the fact that detox is not an overnight phenomena. Here’s the deal: real, effective detox doesn’t happen overnight. It doesn’t happen in a week. Healthy detox in the body rests on a nourishing diet and stress management. We can, however, utilize additional safe and gentle methods to support our body’s detox processes. The following daily detox routines are effective and work with your body, not against it. Why should we support daily detox? Many of the fad detox programs encourage drinking copious amounts of water or a specified liquid each day to “flush out the toxins.” This is not accurate and over-hydration can be quite harmful. No other creature is so removed from its instinctual programming to the point of accidentally over drinking. Over-hydrating can actually lower metabolism and it is stressful to your body if you already have a slow metabolism to drink too much liquid. Additionally, when the adrenals are stressed or fatigued, excess water intake without adequate salt intake can lead to cellular dehydration. Want to learn more? Read my post on Metabolic Hydration! Start each morning with warm glass of lemon water: warm 1/2 to 1 cup of filtered water to body temperature, then squeeze in the juice of 1/4 to 1/2 of a lemon. If you don’t have a lemon on hand, you can also use 1 teaspoon of raw apple cider vinegar. Add a pinch of sea salt, if desired, to support your metabolism. Sip mindfully and let it awaken your senses. Why it works: lemon water (or apple cider vinegar water) supports a balanced pH of the body and helps flush toxins through the liver. It can also stimulate stomach acid production before breakfast– a very good thing, since adequate stomach acid is essential for digestion! If you have bloating, acid refux, or constipation, this morning drink may help your symptoms. Troubleshooting: Since fluoride and chlorine in tap water is toxic to the body, it is a worthwhile investment to purchase a quality water filter. My family uses the Berky Water Filter with the fluoride filters. This is my favorite! Jump on a trampoline 10-20 minutes each day. This doesn’t need to be a strenuous workout–your feet don’t even need to leave the trampoline. I turn on iTunes and enjoy a little bounding party each morning. I bought this mini trampoline and it is affordable and compact. Why it works: The skin is the largest detoxing organs of the body. Dry brushing increases circulation which supports the discharge of metabolic wastes. It purifies the body by stimulating the lymphatic system to drain toxins into the colon. It clears clogged pores, improves muscle tone and rejuvenates the nervous system (Source). 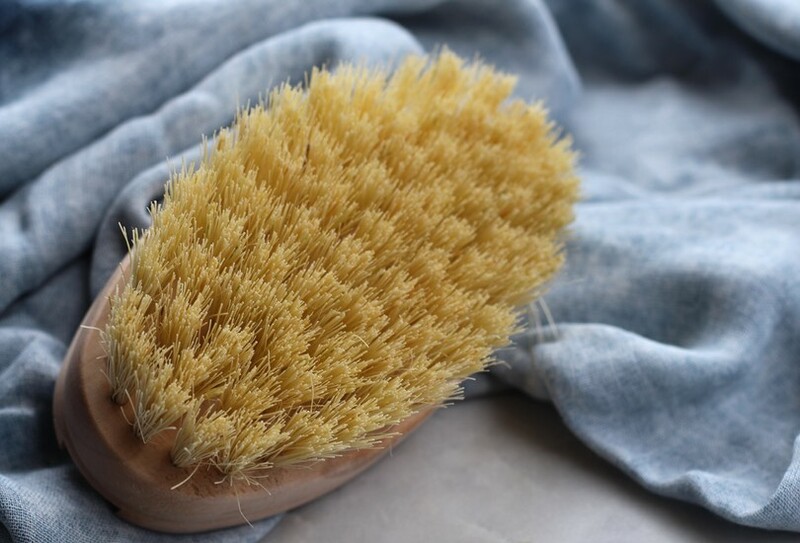 As a bonus, dry brushing softens skin and encourages cell renewal. It is heralded as the ultimate cellulite treatment. I have dry brushed faithfully for a year and, to be honest, have not seen a reduction in cellulite. Real cellulite treatment begins with gut healing and digestion (which I’m working on), and this can take years to correct. Troubleshooting: Your skin will be sensitive during the brushing, for the first week or so. The brush is, well, rough. But after a couple weeks, your skin will be silky soft and able to tolerate firmer brush strokes. After your shower, turn the tap to as cold as you can stand it. Rinse for 30 seconds (or longer, if you can stand it!). If you feel lightheaded during the cold rinse, gradually decrease the temperature over a few weeks, until you have built up tolerance. Why it works: alternating hot and cold water is a form of hydrotherapy, an ancient and universal healing technique. Hot water expands your blood vessels, and the cold water immediately constricts them. It is the expansion-and-constriction motion that supports lymphatic drainage and helps push stagnant toxins from your system. Troubleshooting: Fluoride and chlorine are absorbed through the skin. The best solution is to buy a water filter system for the whole house that removes these toxins. I don’t have that option, so I make use this shower filter to remove chlorine. You don’t need to be athletic or flexible to do these two detoxing yoga poses. First, get your Downward Dog on! Spend as long as you wish in the pose. The second pose is Legs-Up-The-Wall, a very relaxing pose. I like to spend 5 minutes in this pose every morning, as it is a gentle way to transition into the activities of the day. Why it works: In Downward Dog, the heart is higher than the head and this increases circulation and aids lymph flow. Legs-Up-The-Wall also supports lymph flow, lymph drainage, and circulation (Source). 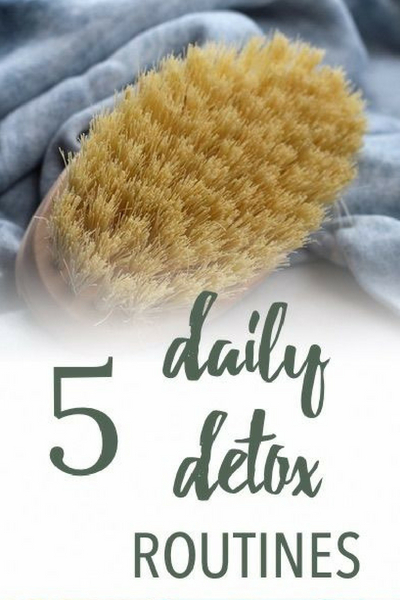 Are you up to trying this easy daily detox routine? Do you practice other methods of gentle detox? Hi Lauren! First of all I want to thank you for all these interesting posts. I want to know if it is ok a water filter that I am interested in, is Pimeg waterfall, it eliminates chlorine, fluoride, and some other particles, adding minerals… Just want to know if it’s reliable and a good option, I’m trying to avoid the most chemicals I can. Thanks and congratulations for your blog, it is allways a pleasure to read you. I am a loyal reader of your blog and really appreciate all the information you provide. I am searching for a water purifier and I need one that filters fluoride especially. You recommend the berkey so I am wondering if you have ever tested it make sure it filters out fluoride. I recently listened to a report from board certified nutritionist and traditional naturopath David Getoff who tested the berkey and did not find that it removed fluoride. What is your opinion on this? I was just about to purchase the berkey when I came across this report. I really don’t want to buy one and then test the water myself if I don’t have to. Hi 🙂 Great blog! I was wondering about something I read about drinking lemon water in the morning. The person said it contained psoralen which made your skin photosensitive, so you should only drink it in the evening. I was just wondering your opinion about this. Do you think there is something in that? I also drink it in the evenings although I did not know the reason why. Happy to come across this comment. I have a question…if you do the lemon water I have heard that should be done first thing before you do anything else. Oil pulling I have heard the same thing, that it should be done before ingesting anything. If you do both how would you do it? Do the oil pulling first because you spit out the oil. Then drink your lemon water. If you are curious.. I use lemon essential oil instead of lemon juice for my daily detox. I would love to tell you more! How much lemon essential oil do you use? Thank you for this post of great interest. One precision though: I’ve often read the lemon-water should always be drunk with a straw to preserve the enamel of the teeth. ???? I think that could be a good precautionary measure, thanks for the suggestion! The link to the skin brushing video is missing. I heard from a yoga instructor not to do downward dog pose or a pose similar ? if you have high blood pressure, you don’t want your head lower than your heart. I’ve been dry brushing for almost 3 years. Within a very short period, I did get rid of thigh cellulite. Now, I am not a slim person but on the other hand, I do have a jiggle. My thighs are smooth! Also, I’m now 74 and I do not have skin checking. Many older people have these mini diamond patterns all over. My skin is very smooth. Last, facial exercises work, but you have to work the muscles that are holding up the skin, not just the skin. To get rid of chin sag, those muscles are on the left and right side of the cranium. Put pressure on those muscles with your fingertips and using facial muscles, move them around. You should see results within 2 weeks if your facial muscles are really out of tone. Quicker if they are not.